Phase One – Want a Revolution? Nechville is leading the “Banjo Revolution” into new territory with his unique designs for acoustic and electric banjos. Tom will have several instruments on display for you to jam with and Tom will perform some music accompanied by local players. You’ll see inside the Nechville mechanism and learn what makes Helical-Mounting so special. Go beyond standard banjo setup conventions and learn what really makes the banjo sound its best. Tom will uncover secrets about traditional banjos and divulge solutions to common banjo problems. Tom may invite one or more attendees to receive a free set-up during the class. He will cover the essentials of set up and explain how his designs simplify the process of setup and maintenance. For serious players and builders who require ultimate performance from their banjo, Tom enters into the new territory of alternative materials for tone chamber construction. He also explains what he has learned about the effect of wood and alternate materials on banjo tone. 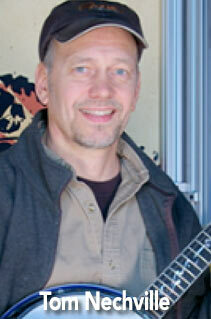 Tom Nechville has been in business since 1989, manufacturing professional banjos and related accessories. His patented Helimount frame, adjustable neck attachment, beveled armrest, and compensated Enterprise bridges are setting the professional standard for players worldwide. His book, The Dynamics of Banjo Sound is a definitive guide for banjo set up. Nechville Musical Products is always innovating to meet the changing needs of modern musicians. Nechville’s refined acoustic and electric banjo designs have helped direct a new worldwide spotlight on the banjo. Web Links Nechville Musical Products: www.nechville.com Banjo Revolution: www.banjorev.com Dynamics of Banjo Sound Workshop: www.nechville.com/workshop.html Products for Sale Exclusive inventory of Fine Banjos, Armrests, Straps, Pickups, Enterprise Bridges, Parts, and Dynamics of Banjo sound Book.